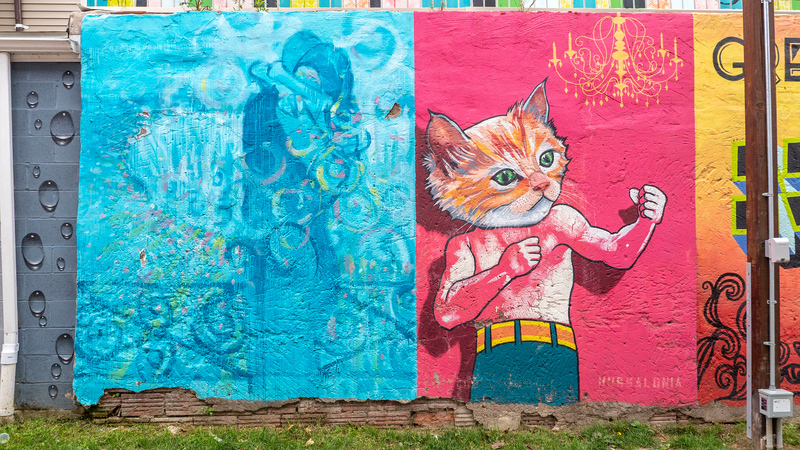 Who else loves discovering street art while they travel? I love finding the best street art when I travel to cities around the world. 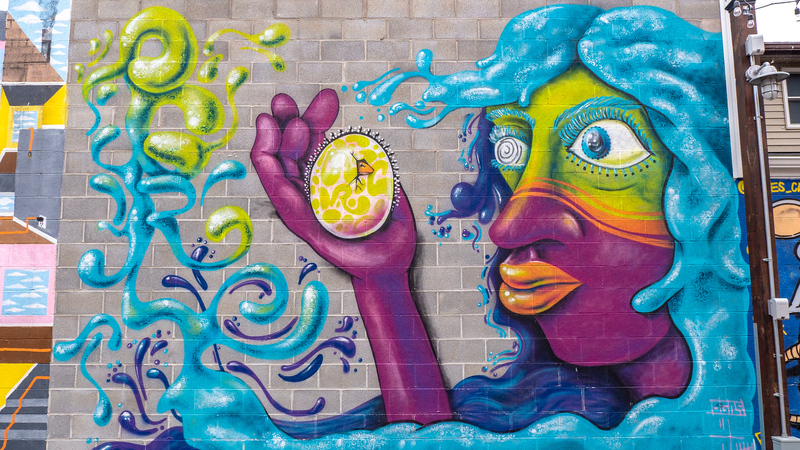 Street art often takes boring, plain, or ugly spaces and transforms them into beautiful art that’s available for everyone to enjoy. 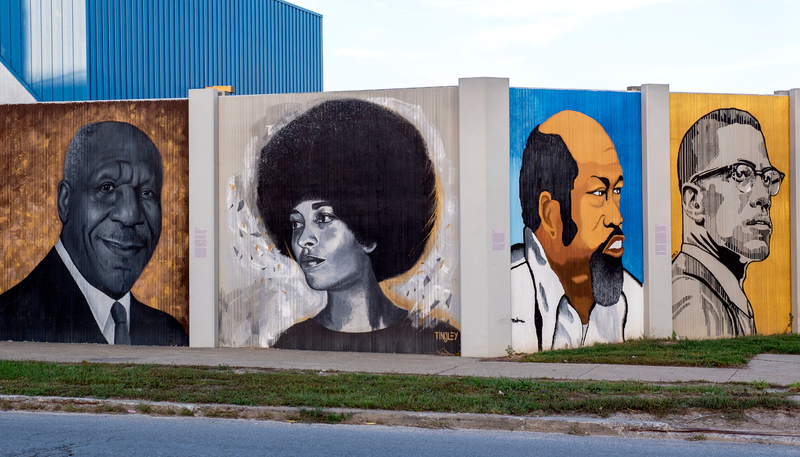 From Toronto to Miami and Galway to Nashville, I have found colourful and meaningful murals. Buffalo is no exception. 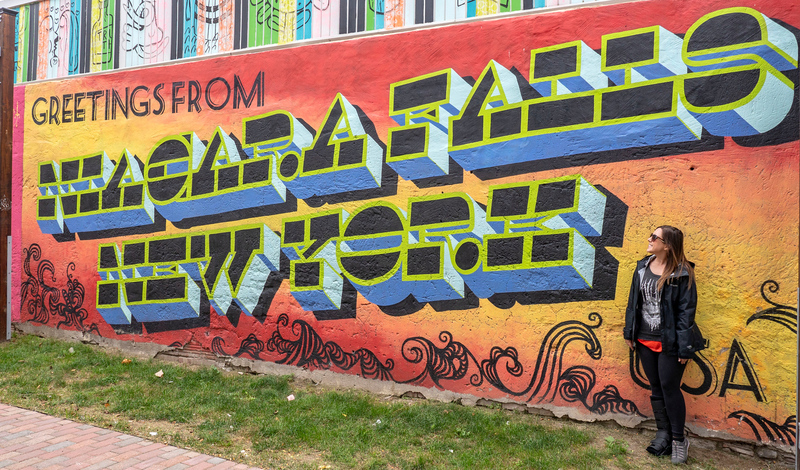 This city has some of the most vibrant and brilliant public art that I’ve ever witnessed. 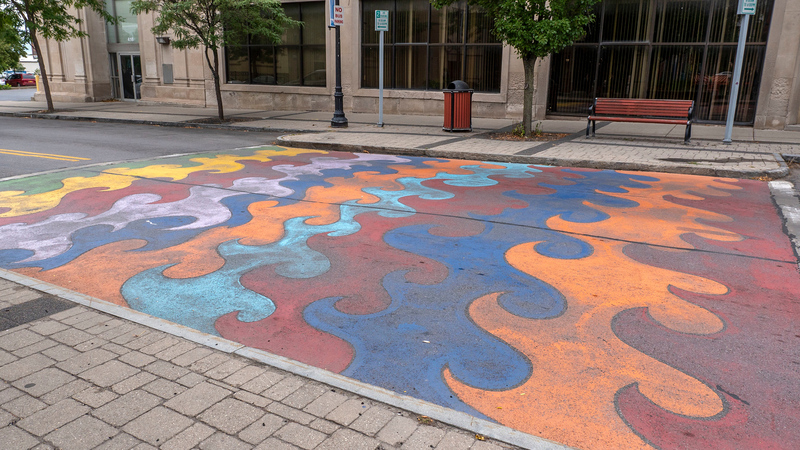 If you find yourself in Buffalo and Niagara Falls, New York, be sure to check out the various forms of public art, including wall murals and sculptures outside the Albright-Knox Art Gallery in Buffalo. 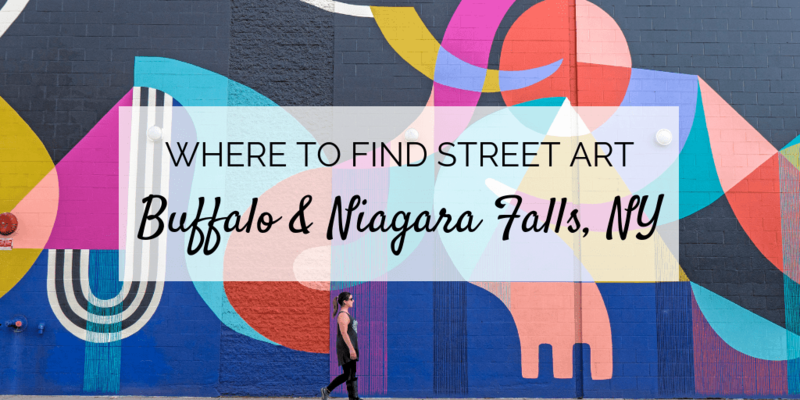 Here’s where to find street art in Buffalo and Niagara Falls. 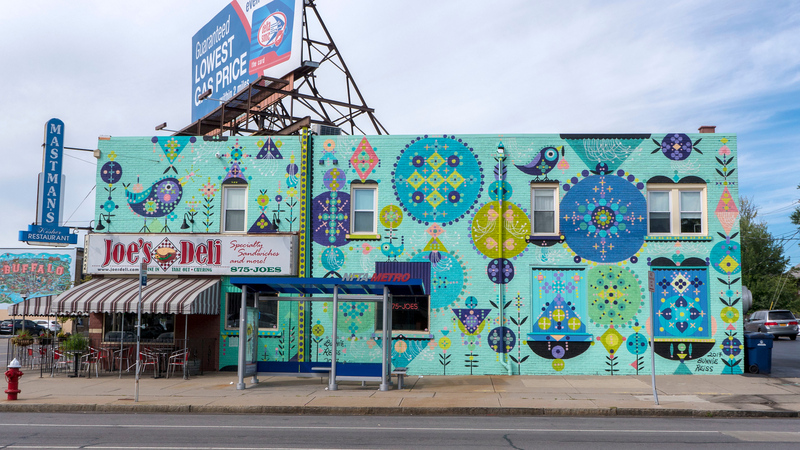 This is one of the brightest and most welcoming murals in Buffalo, painted by artist/graphic designer Casey Milbrand. 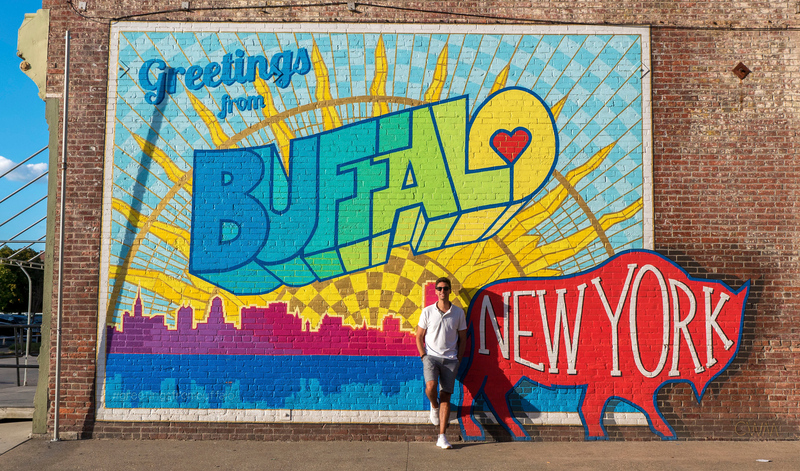 It’s designed to look like a giant postcard and emphasizes the friendly vibes of Buffalo local residents. 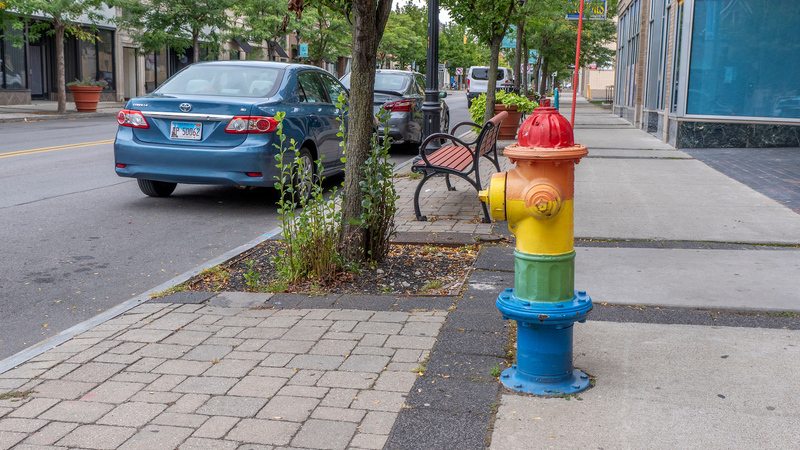 This particular work of street art in Buffalo is spreading cheer about a city that’s revitalized and coming into its own. 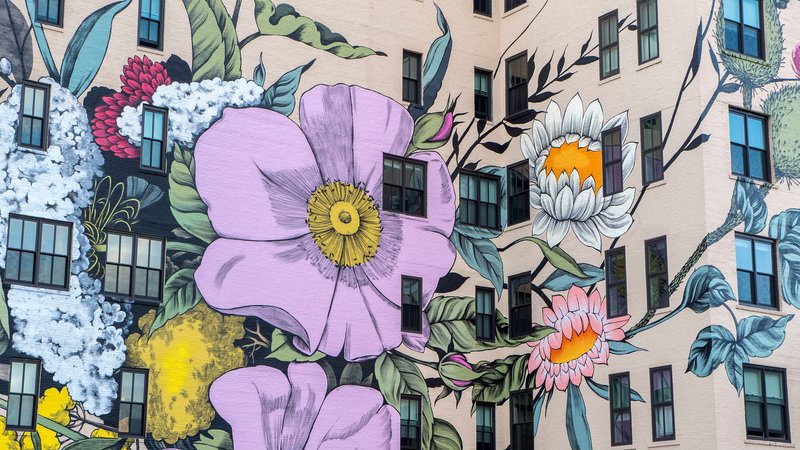 You can find this mural on 461 Ellicott Street in downtown Buffalo. 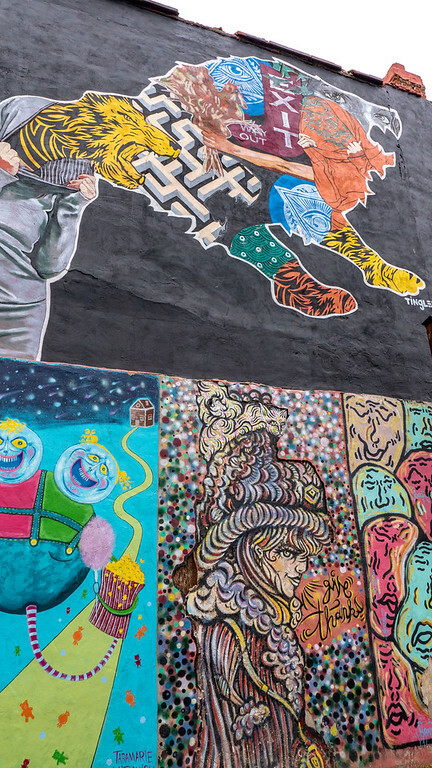 The Freedom Wall wraps around a city block and was designed by John Baker, Julia Bottoms-Douglas, Chuck Tingley, and Edreys Wajed. 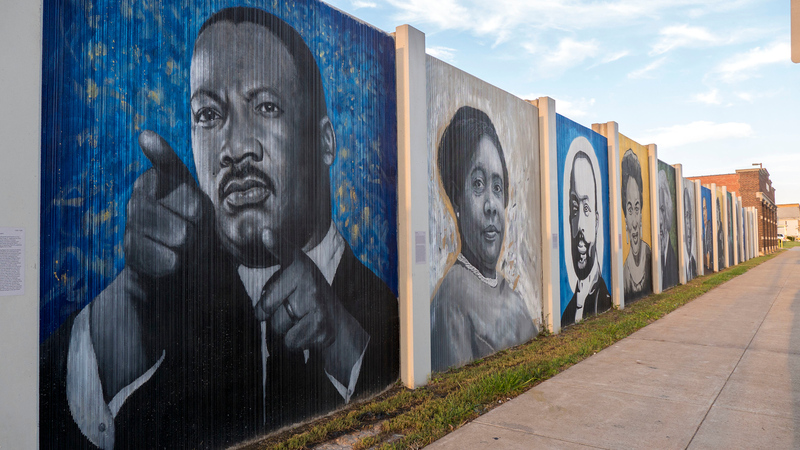 The wall depicts 28 notable and important civil rights figures in the USA. Before it was painted, it was a barren, concrete wall surrounding the Niagara Frontier Transportation Authority’s bus maintenance depot. 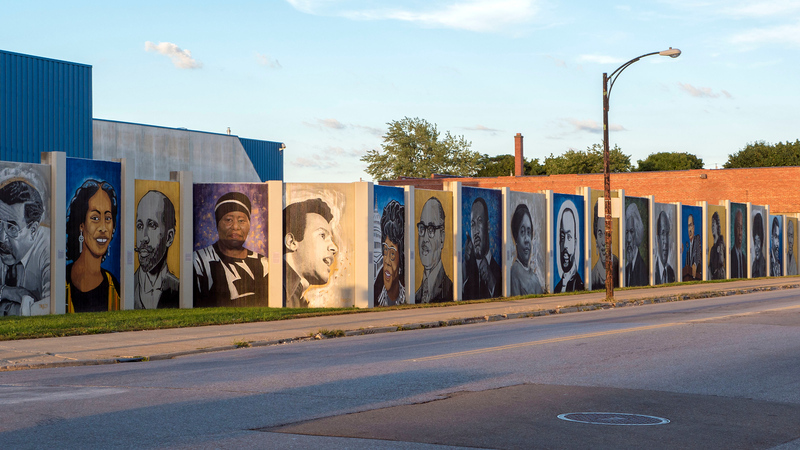 Now, it’s a colorful wall showcasing important African American leaders throughout history, along with plaques beside their portraits with more details. 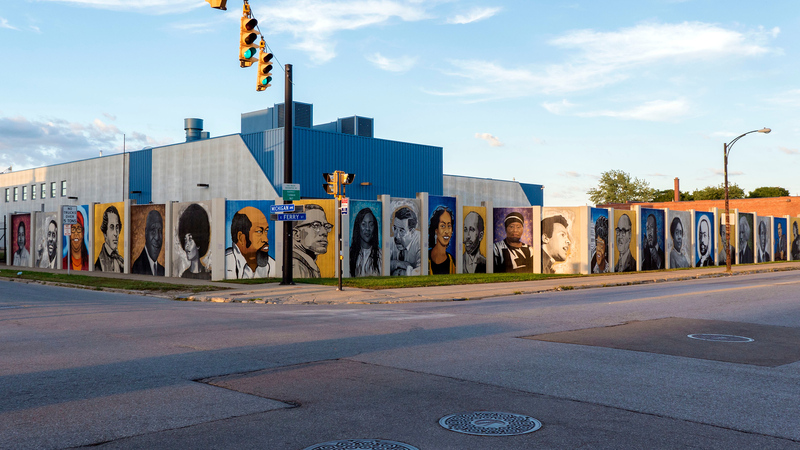 You’ll find the wall at East Ferry Street & Michigan Avenue, Buffalo. 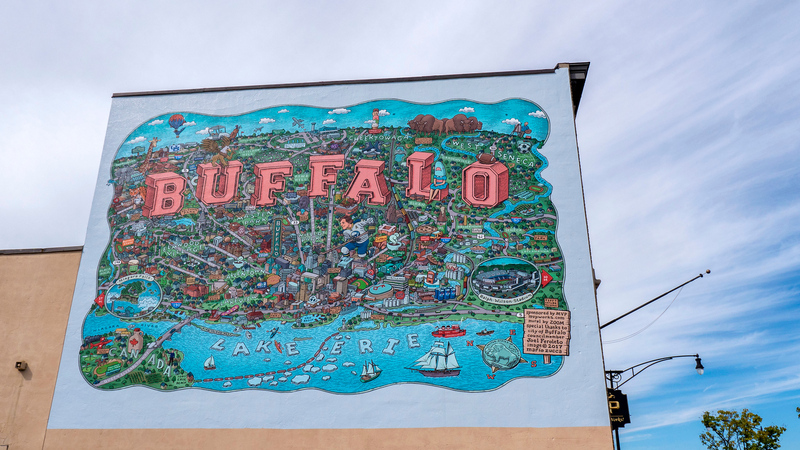 The Magic Buffalo mural is painted by artist Bunnie Reiss, and it wraps around the Joe’s Deli building on Hertel Avenue. 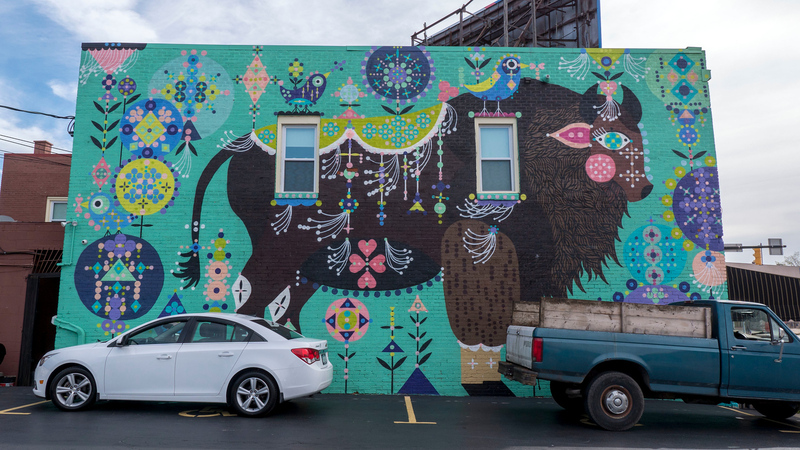 This beautiful work of street art in Buffalo evokes imagery from the artist’s Polish and Russian heritage, such as folk art and fairy tales. She feels that public art “encourages people to interact and gather and help people slow down their busy lives.” I fully agree! 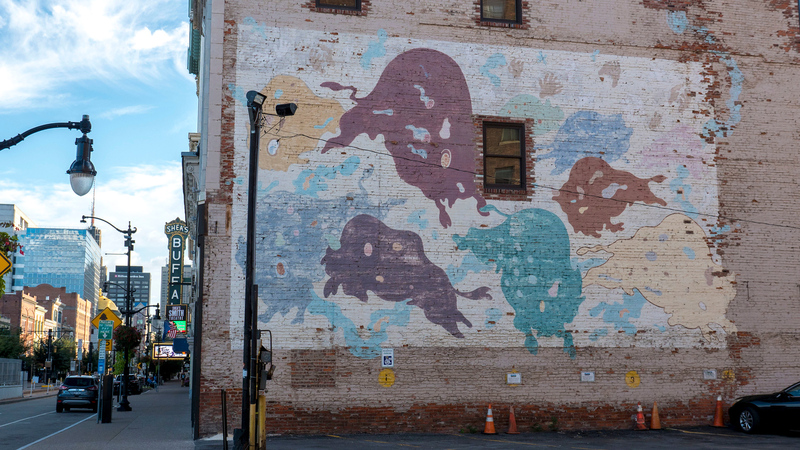 Be sure to walk around the opposite side of the building to view the spectacular artwork of the buffalo. You’ll find this one on 1322 Hertel Ave. 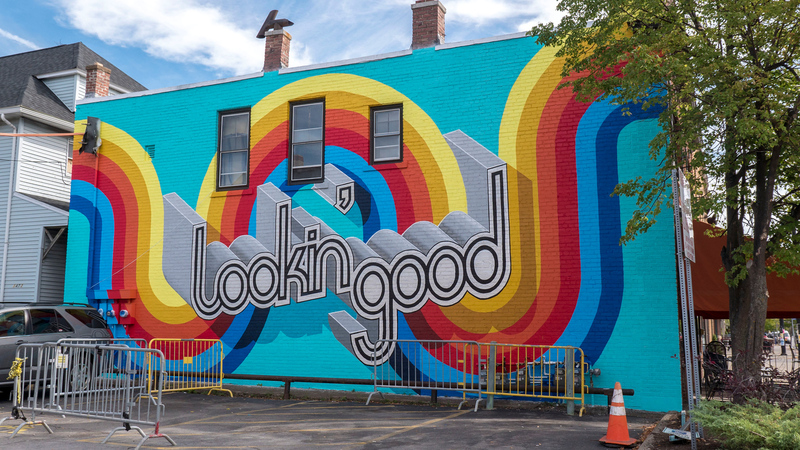 The Lookin Good mural is a brand new installation by the same artist who painted the Greetings From Buffalo mural, Casey Milbrand. 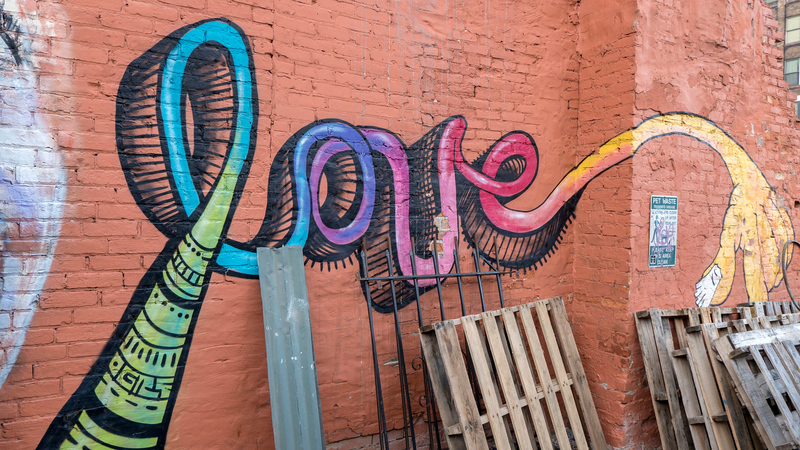 It’s another work of street art in Buffalo that sends good vibes and feelings with its message and rainbow colours. You can check it out at 1472 Hertel Avenue. 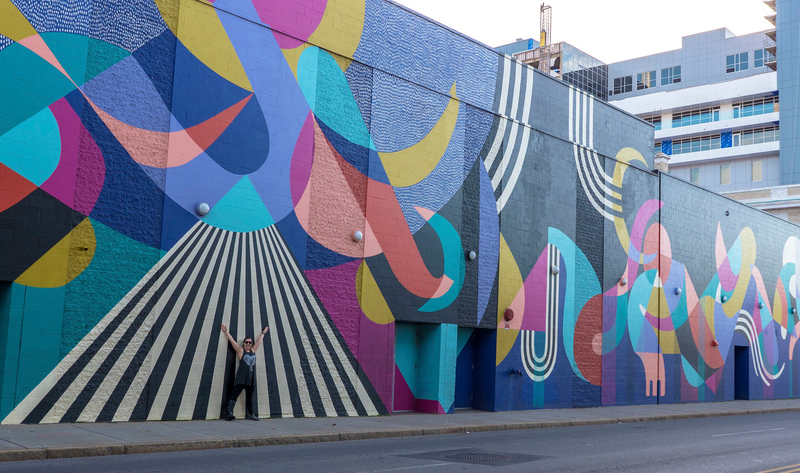 Noodle in the Northern Lights is a massive mural in Buffalo that spans an entire city block. 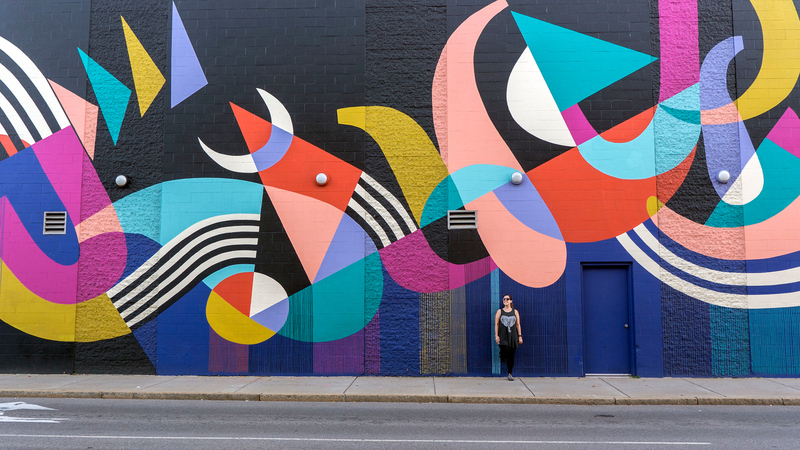 Painted by Baltimore artists, Jessie and Katey, various playful geometric shapes and patterns cover the entire side of Shea’s 710 Theatre. This one is perfect for Instagram! 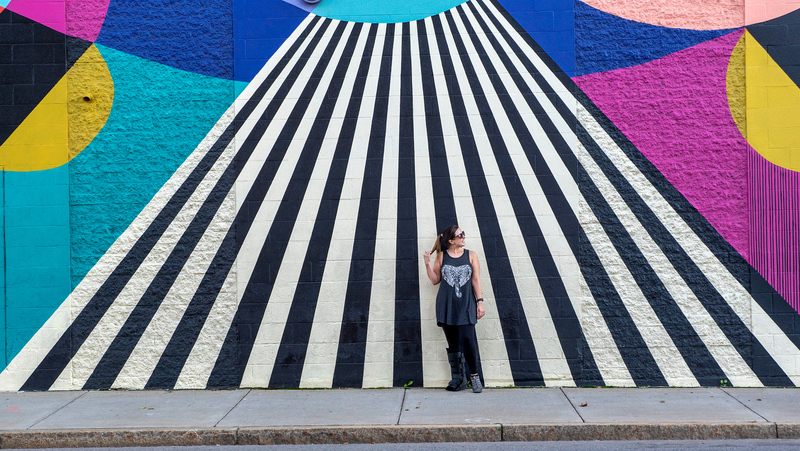 There are so many opportunities to snap fun pics outside of this mural, so get out there and explore! Noodle in the Northern Lights is on Tupper Avenue between Main and Pearl Streets. 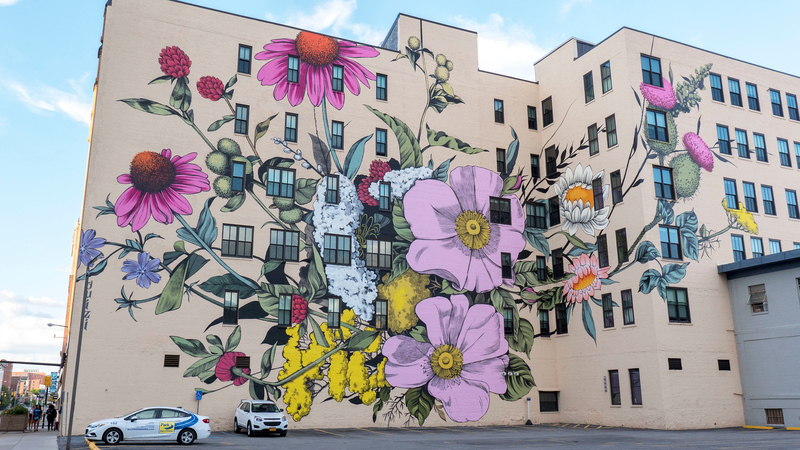 Wildflowers for Buffalo is one of the largest murals in Western New York. 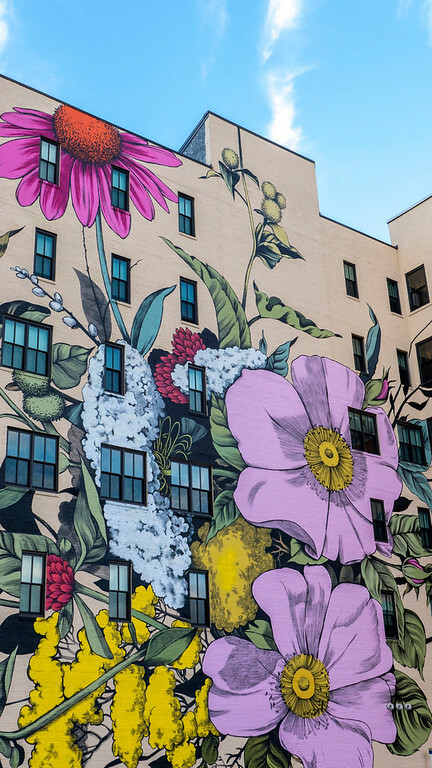 It’s certainly one of the most stunning murals I’ve ever seen! 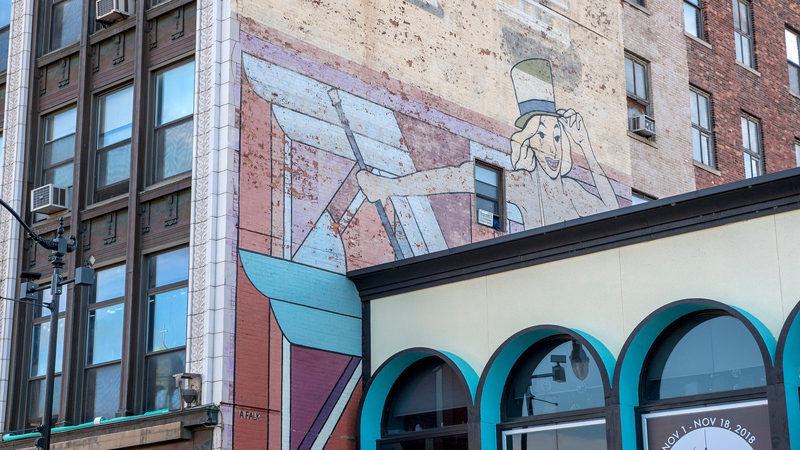 American artist, Louise Jones, evokes imagery that relates directly to the original use of the building as an early 20th century hat manufacturer. You’ll see wildflowers and hat pins sprawling across the entire building. 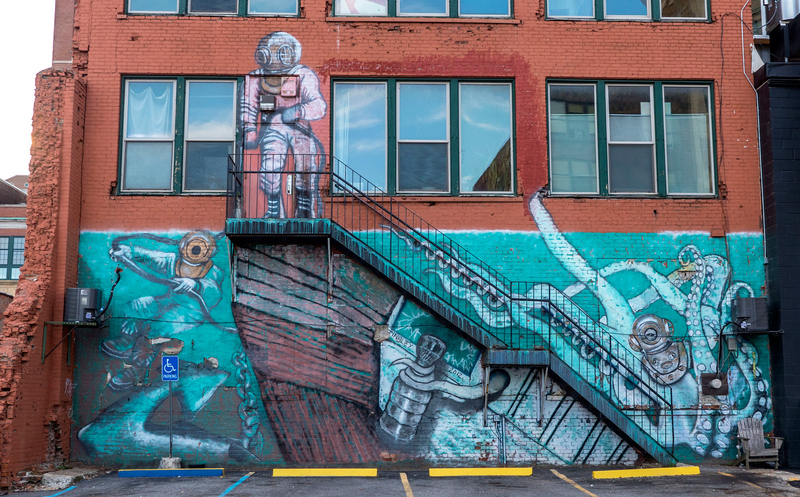 It’s at 465 Washington Street, and this is some street art in Buffalo that you absolutely must see in person. As a side note, we noticed a second work of art in the process of being painted right across the road! You’ll have to return to see how it looks. 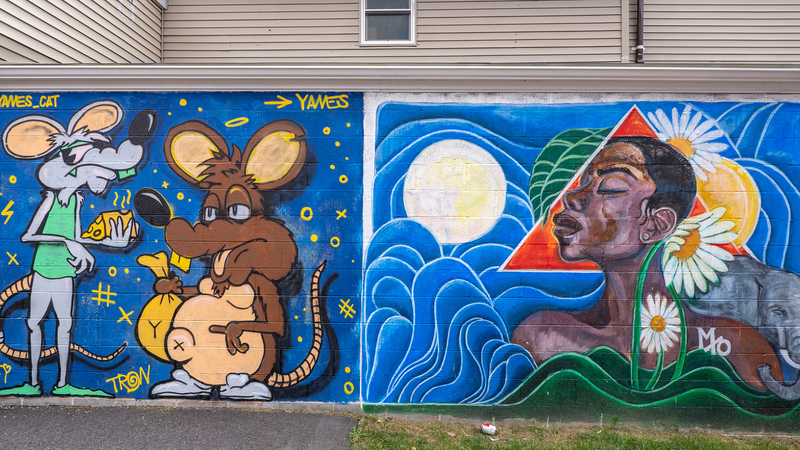 Here are also a couple more murals that we found while walking around downtown Buffalo. 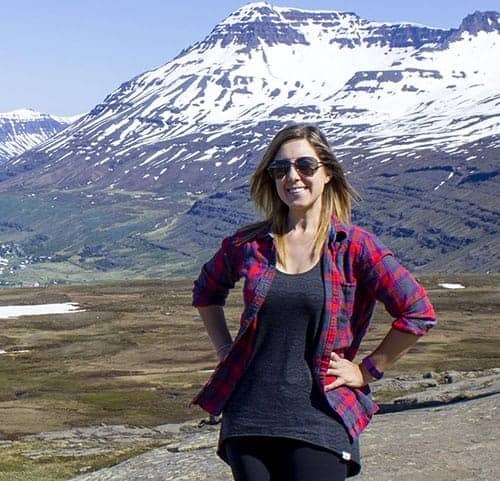 Take a stroll and discover these ones for yourself! Sometimes the fun is walking around and exploring on your own. 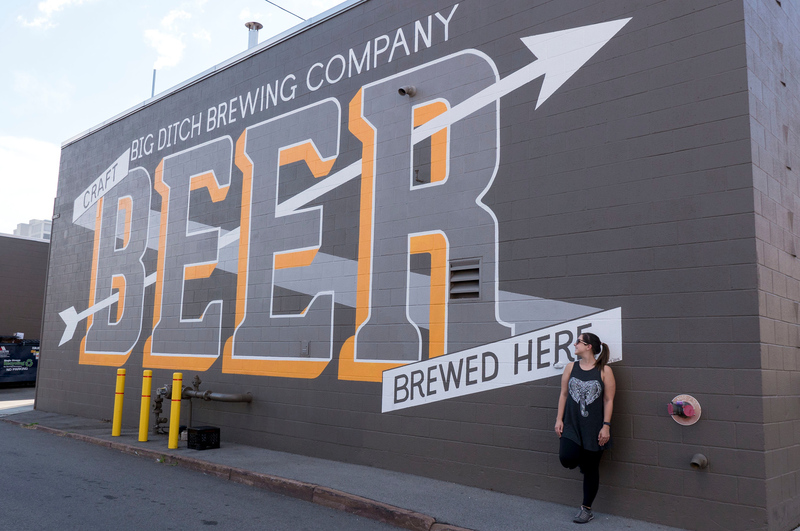 The last one is right on the side of Big Ditch Brewing Company. Stop by for a pint while you’re at it! 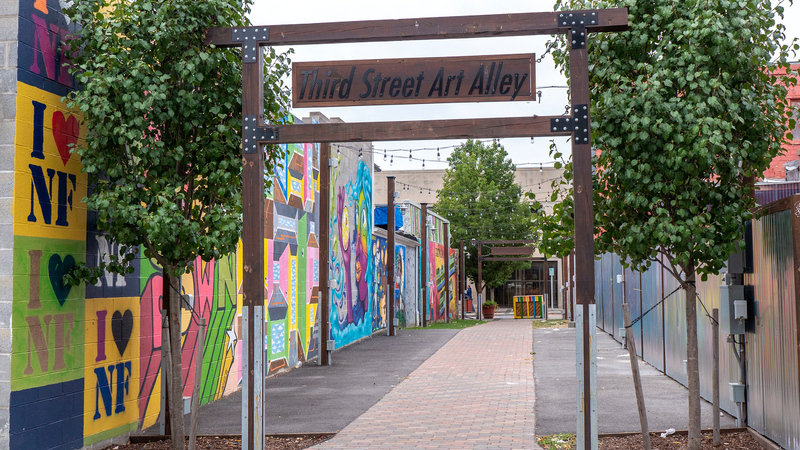 Apart from the murals, Third Street is a very colourful place. 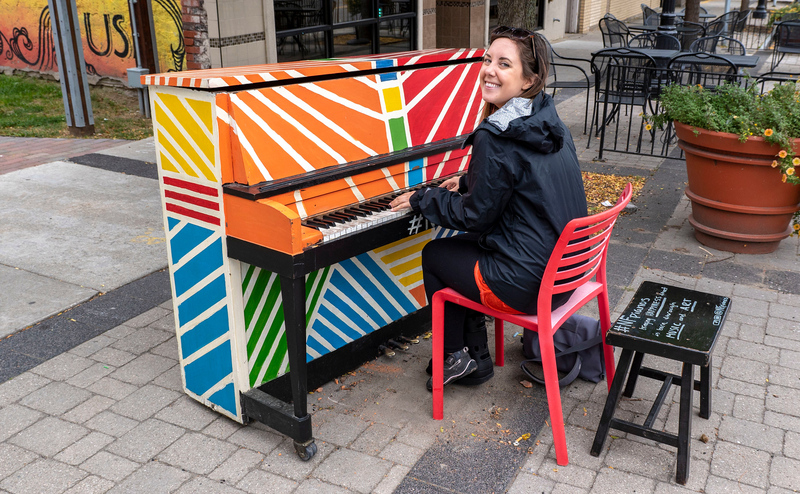 There’s a rainbow piano in front of Third Street Art Alley, a rainbow cross walk, and even a rainbow fire hydrant. 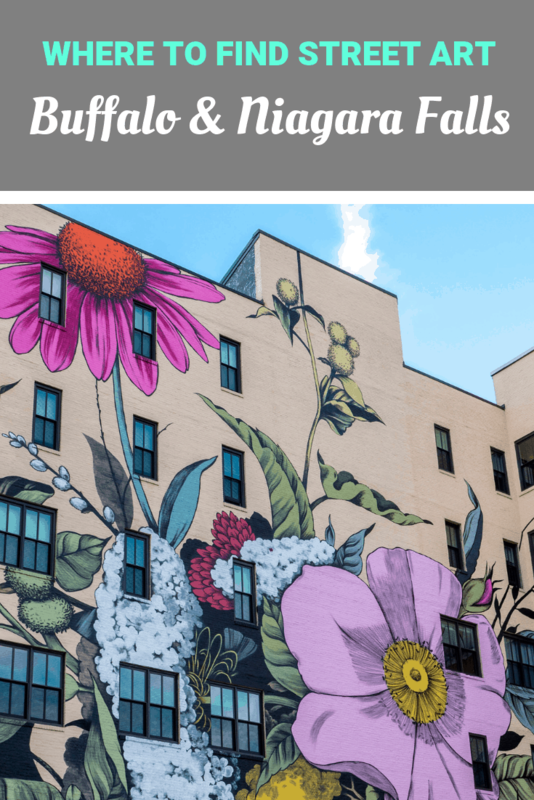 While I’m sure there is even more street art in Buffalo and Niagara Falls waiting for me, this guide to murals in Buffalo is a great starting point. 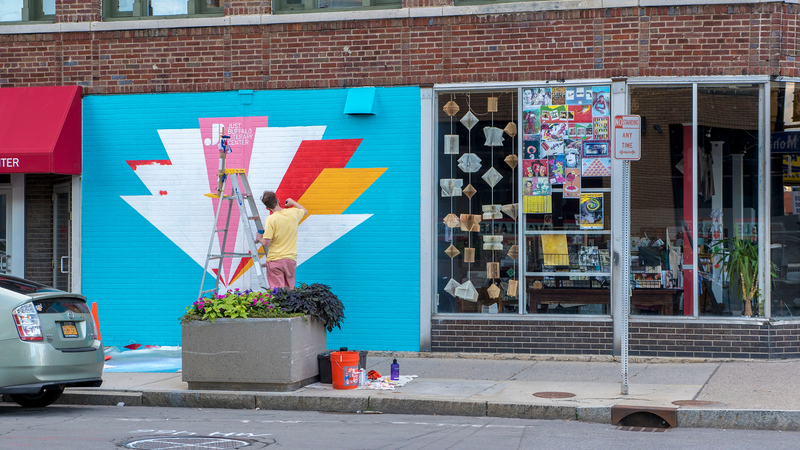 Walk around the city and go street art hunting! 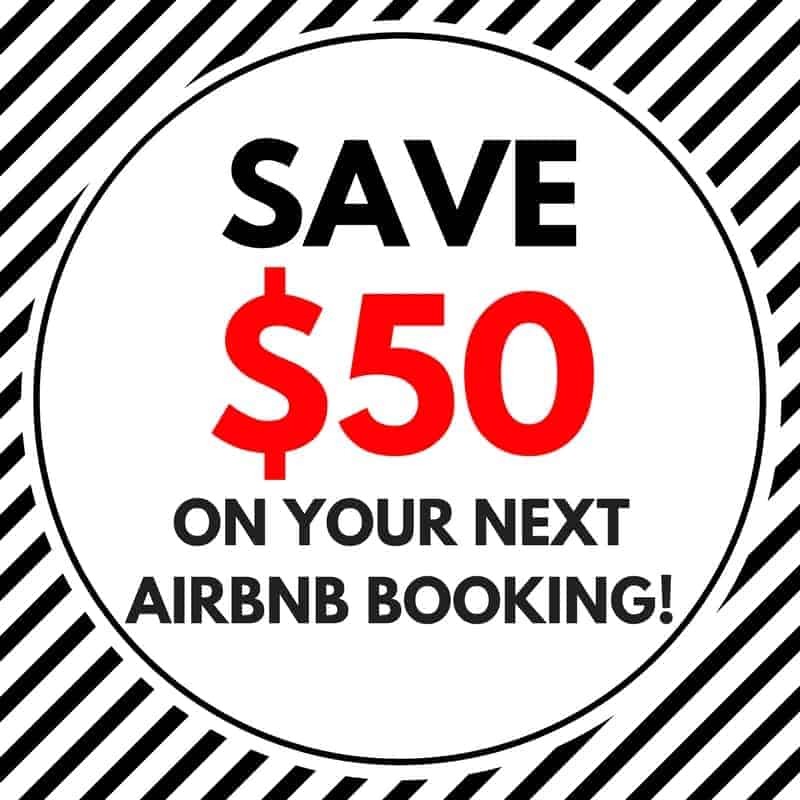 PIN this image to Pinterest for future reference. Click the top left corner. 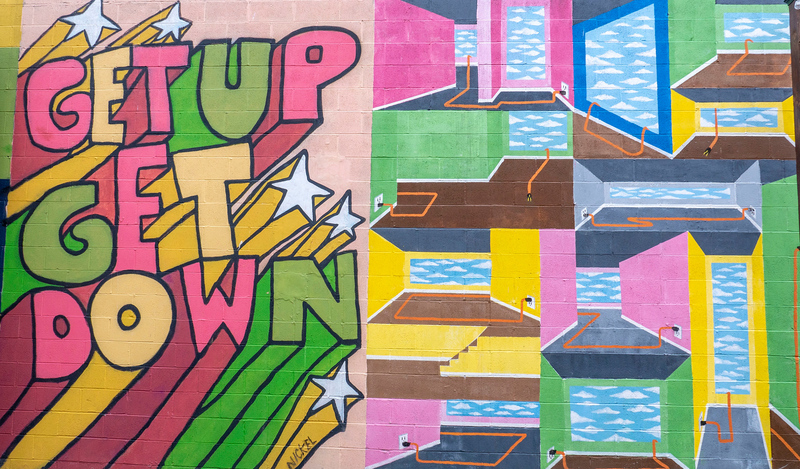 Where’s your favourite city to find street art?